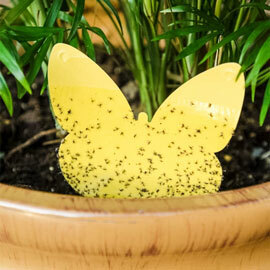 Protect Your Houseplant From Pests | Gardens Alive! Question. Mike: Can you recommend a treatment for lemon trees, hibiscus, and coleus that have spider mites, aphids, and sticky black spots on the leaves before I bring them in from their summer outside? Please hurry! I only have about a week left before it freezes here! I've been growing my houseplants outside all summer and would like to know what I should treat them with so that I will not bring pests into the house along with the plants. Answer. For all but a few very specialized pests (which we'll deal with in a minute), water is the answer. Cradle the plant with one hand and use the other to really blast away at it with a hose nozzle that delivers a sharp stream of water, or a pressurized sprayer that has never held chemicals of any kind. Thoroughly clean every part of every plant, especially the undersides of the leaves. Lay the plants down on their sides to get a better angle on those lower leaves. You're going to get wet doing this. If you don't, you aren't doing it right! If it's freezing out, use slightly-warm water. Don't use soap—insecticidal soaps don't work the way most of you seem to think they do—or chemical pesticides, which are totally unnecessary. This is good old-fashioned "throw the bums" out PHYSICAL removal! Water blasts are very effective at killing aphids and other soft-bodied pests. (That black soot on the leaves is aphid poop—"frass" to people who want to talk about bug poop but still seem classy.) And water is doubly effective against spider mites, which need a dry environment to thrive. (If they show up over the winter, daily misting is enough to send them to their arachnid reward). 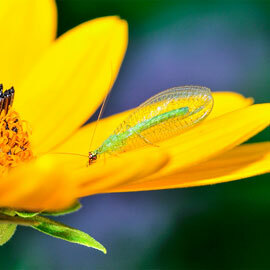 But don't expect aphid success with a flaccid stream from a garden hose. You need to BLAST the plants with a sharp, thin spike of water; the hydrological equivalent of a laser beam (it won't harm the plants but it should sting if it hits you). And you must roll them over and get at the undersides of the leaves—that's where the little terrorists are lurking. Question. Dear Mike: I place our houseplants out under the trees during the summer months. They love growing in the dappled sunlight. But when I bring them back in, the soil seems to harbor little gnats that fly into our faces all winter. Very annoying! Is there anything I can mix into the soil to kill the gnats before I bring the plants back into the house? Answer. Good work, Carol—you've half identified your pests by name! They're 'fungus gnats' (I have no idea where the fungus part comes from); and they do indeed breed in houseplant soil and have very bad table manners. They're easy to control, but NOT with sharp sprays of water because they're lurking deep down inside your dirt. You want "BTI". 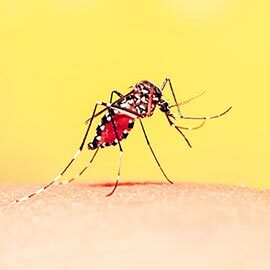 This form of the naturally-occurring soil organism "Bt" (Bacillus Thuringensis) is best known for killing mosquito larva in standing water outdoors (it's the 'active' ingredient in those mosquito dunks you toss into ponds), but it is also very effective—and EPA approved—for use as a 'soil drench' against fungus gnats in houseplants. Just mix some up as directed and use it to water your plants. That's it! The BTI will destroy the pests without any risk to you, the plants or anything else (and you can save any unmixed leftovers to use against skeeters next summer). Or get some 'cat grass'—that's the mixture of seed and dirt sold in pet stores so indoor kitties can have something green to nibble on before throwing up on your white shag carpet. Sprout some in a pie pan and put it near the infested plants. The gnats will flock to this lush green growth, which you then take outside. Repeat a few times to get new gnats as they hatch. Question. Mike: I have a ten-foot tall ficus that spends the summer outdoors. (It takes three people and an appliance dolly to move it!) But small black "helmet" shaped bugs have attached themselves to the branches. What can I do to stop this infestation while the plant is still outdoors? It was a gift from my son and means a lot to me sentimentally. READ COMPLETE ANSWER You've got scale. Start with a water spray; the immature stages of this pest are easily washed away. But the armored adults are generally unmoved by Category 5 streams of water. The standard advice is to swab each little beast individually with a Q-tip dipped into rubbing alcohol, which removes their wavy protective coating (and prevents infection if they get a little cut). A better answer is to let the tree dry off after its 'warshing' and then spray it with 'horticultural oil', a catch-all term for any professionally-made oil-based spray used to smother pest insects. Insects breathe through their skeletons; smother them with oil and they stop breathing. The most common type is "dormant oil", a heavy, petroleum-based product sprayed on fruit trees over winter (while they're dormant—hence the name). For houseplants, you should use one of the "summer sprays"; these lighter-weight versions are made with vegetable oil. Or use a product like GA's Pyola, which will smother the pests with its canola oil and then kill them again with permethrin, a synthetic version of one of the best-known botanical insecticides. Be sure to turn that big ficus over on its side and spray the undersides of the leaves well before you bring it in; you'll likely see lots of scale hiding down there.